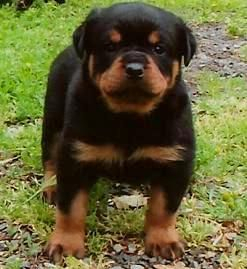 The Rottweiler is considered a large to extra large breed (100+lbs=Extra Large) with powerful features and an impressive appearance. The dog’s coat is black with tan or brown markings, and is dense, straight, coarse and of medium length. The head is broad, round and of medium length. Ears are triangular, pendant, and medium sized, and prick up to change the overall profile of the head when the dog is in an alert state. The expression is proud, alert and self-assured. The body is compact and muscular, with a level back – the dog is generally slightly longer than it is tall. The tail is generally docked short. The Rottweiler’s gait can be described as a trot, projecting confidence, power and balance. 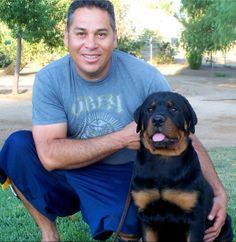 The Rottweiler is powerful, calm, trainable, courageous and devoted to their owner and family, Loyal and Protective, they will defend their family fiercely if needed, seemingly immune to pain. 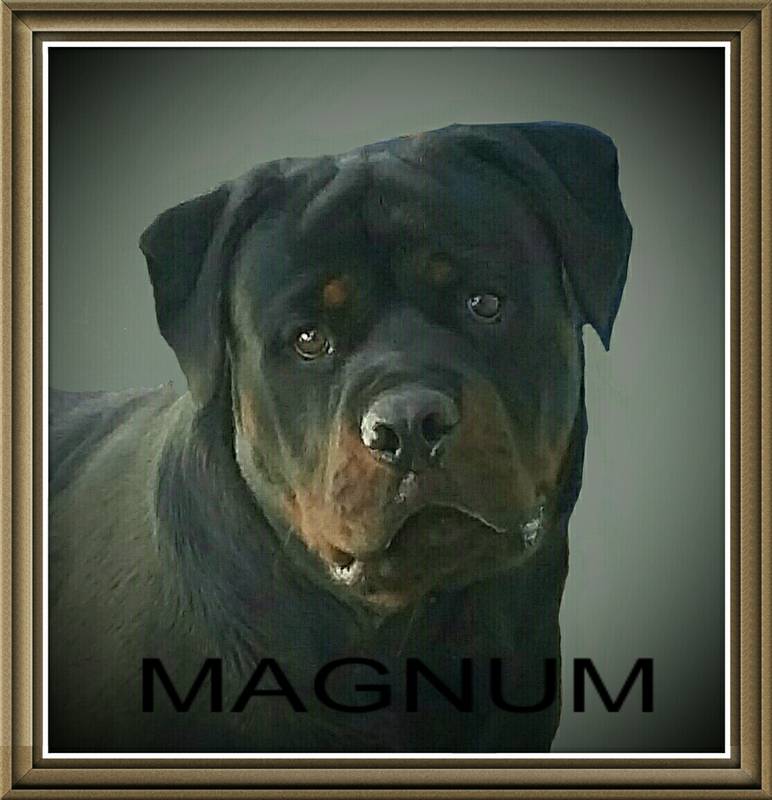 Serious, even-tempered, brave, confident and alert, this breed needs and owner who is strong minded, calm, but firm and able to handle their massive size. A Docile, natural guard dog with a laid-back, reliable temperament. They are highly intelligent and have proven their worth beyond question in police, military and customs work over many centuries and can be trained for competitive obedience. Because of their size, training should begin when the puppy is small. This breed needs lots of leadership and socialization. They will not be happy confined to a kennel or backyard. The obejective in training this dog is to achieve a pack leader status. It is a natural instinct for a dog to have order in their pack. When we humans live with dogs, we become their pack. The entire pack cooperates under a single leader. You and all other humans MUST be higher up in the order than the dog. That is the only way your relationship can be a success. 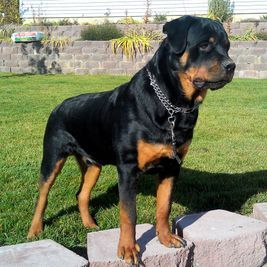 When the Rottweiler receives consistent leadership and is trained, it will be a good playmate for children and it will accept cats, other dogs and other household pets, as long as the dog has been socialized well and has owner who assert their authority over the dog. Friends and relatives of the family are normally enthusiastically welcomed. As an athletic and fairly energetic breed, the Rottweiler needs daily exercise and attention. Mixing in an occasional game with the dog’s daily walk is a good idea to let the dog flex its mental muscles as well. 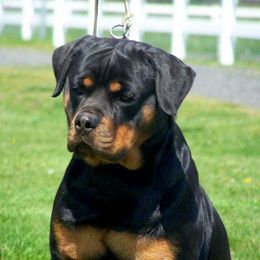 It is also of utmost importance to start obedience training as early as possible, and to be consistent and firm in the dog’s training; Rottweilers are a dominant breed and have a tendency to become stubborn and unmanageable if not properly disciplined. The Rottweiler has a preference for cooler climates and may become overheated if not given adequate water and shelter on hot days. The coat is easy to care for, requiring only the occasional brushing. Major health concerns for the breed include canine hip dysplasia, elbow dysplasia, subaortic stenosis and osteosarcoma. Minor health concerns include gastric torsion, hypothyroidism and allergies. Although a versatile breed used in recent times for many purposes, the Rottweiler is primarily known as one of the oldest herding breeds. A multi-faceted herding and stock protection dog, it is capable of working all kinds of livestock under a variety of conditions. The breed's history likely dates to the Roman Empire and inn those times, the Roman Legion traveled with working dogs to herd the cattle needed to feed the army. The descendants of the Roman cattle dogs, the Rottweilers proved their worth in both driving and protecting the cattle from robbers and wild animals. Rottweilers were said to have been used by traveling butchers at markets during the Middle Ages to guard money pouches tied around their necks. However, as railroads became the primary method for moving stock to market, the breed numbers had declined. The build up to World War One saw a great demand for police dogs and that led to a revival of interest in the Rottweiler. During the First and Second World Wars, Rottweilers were put into service in various roles, including as messenger, ambulance, and guard dogs. 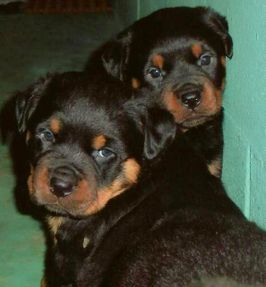 Deutscher Rottweiler-Klub (DRK, German Rottweiler Club), the first Rottweiler club in Germany, was founded on 13 January 1914, and followed by the creation of the Süddeutscher Rottweiler-Klub (SDRK, South German Rottweiler Club) on 27 April 1915 and eventually became the IRK (International Rottweiler Club). 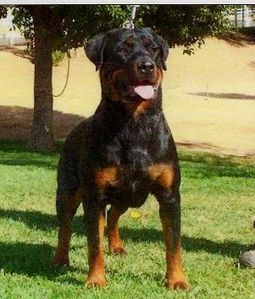 The DRK counted around 500 Rottweilers, and the SDRK 3000 Rottweilers. The goals of the two clubs were different. 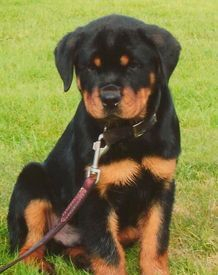 The DRK aimed to produce working dogs and did not emphasise the morphology of the Rottweiler. 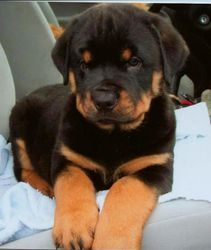 In 1931 the Rottweiler was officially recognised by the American Kennel Club In 1936. In 1966, a separate register was opened for the breed. In fact, in the mid 1990s, the popularity of the Rottweiler reached an all time high with it being the most registered dog by the American Kennel Club.